One of the biggest problems facing petite women everywhere is the shopping dilemma. Many petite women are forced to shop in the kid's department in the hope of finding something that will fit. There are even some women who are perfectly fine with shopping in that part of the store, a by-product of having to do it for so long, however, it will also make a woman feel undignified. 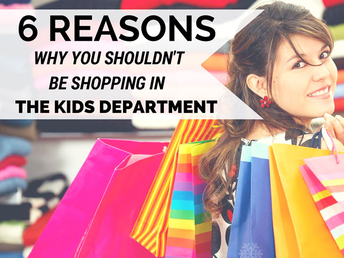 Here are six reasons why you should stop shopping in the kids section. One of the worst parts of shopping in the kid's section is the fact that, most of the time, your clothes LOOK like they came from the kids section. Whether it is an over abundance of bright colors or the designs on the clothes themselves, it is fairly easy to point out clothes from the kids section. And let's face it, nobody wants their friend to compliment them on a shirt they just bought for their twelve year old daughter. On top of that, it can make it difficult for people to take you seriously as an adult. One of the biggest problems about shopping in the kids section is that buying professional looking clothes is impossible. While you may not have a problem with looking unprofessional the majority of the time, it is very important to have some professional clothes on hand when you go job hunting. You want to create a good first impression to a potential employer. It does not matter how well mannered you are or what your qualifications are, if you look unprofessional you will not get the job. You could always buy something in a larger size and then have it tailored but this means big bucks if you're having to do it with all of your professional clothing, so it's best to invest in petite suits from petite brands. Let's say that you see an outfit on one of your friends that you think is cute. You want to ask them where they bought it, but you already know that they are not going to say that they got it in the kids section. Many women find style inspiration from celebrities and friends but this makes it hard for them to replicate when they find out that all of the clothes they love don't run in their size. While petite women may have smaller bodies, the fact of the matter is that their bodies are not childlike. There are some very petite women that have larger bust sizes or wider hips than their average-sized peers. This does not translate well into children's clothes. Kids clothing is designed for undeveloped bodies and it can make it awkward for grown women to try and transition their bodies into clothing of this kind. For some, shopping in the kids section will always be a matter of convenience. But that convenience comes with the price of putting your personality on the back burner. When you shop in the kids department, you are not picking clothes that were designed for people like you, you are picking out clothes that are designed for a person who's biggest celebrity is an anthropomorphic sponge. What you see on the rack is what is available, and that's it. By stepping away from the kids aisle you are allowing yourself the chance to find clothes that speak to your personality, wants, and needs. People will look at you and get a sense of who you are. That is something you just cannot find in the kids aisle because those clothes are not made with you in mind. Some women will try to justify buying clothes in the kids section by saying that they are saving themselves money. This could not be further from the truth. The fact of the matter is that kids' clothes wear down quickly. Kids grow fast and don't need their clothing in each size as long as we adults do. Therefore their clothing tends to be made of cheaper materials and they break down faster. This means that more clothes will have to be bought later on. Instead of putting yourself through the constant cycle of buying and replacing clothes, just pay the full price of buying adult clothes and be done with it. There are a variety of reasons why you should never be caught shopping for yourself in the juniors department and while these are the main ones, there are definitely plenty more. Regardless of your size, it is not only uncomfortable but also more expensive to continue buying clothing in the kids department, not to mention it can be degrading for a woman to be shopping for immature clothing. If you find yourself struggling with the fit of clothing in every area of the store, it's not a good idea to try shopping in the kid's section for the sake of convenience. Do whatever you have to do to move to a womenswear section that is more mature, more appropriate, and much longer lasting. Don't forget to subscribe to our newsletters to get updates on everything petite!